Add style and sophistication to your rooms with custom area rugs. In Timonium, MD, we help you create more appeal in your living areas. If you are someone who appreciates form, function, and fabulous-looking flooring, then our custom rugs satisfy your needs. Whether you want Oriental rugs, Indian rugs, or modern area rugs, we carry all types that cater to your preferences. Best of all, our high-end rugs are better than simply throw rugs. Instead, they give you and your guests something chic to walk on. 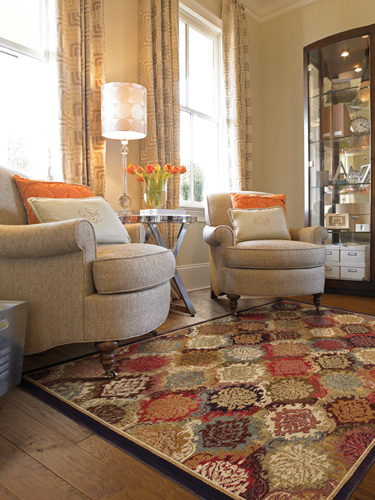 Our flooring store is the area’s choice for stylish rugs. We carry a variety of area rugs in all sizes, shapes, styles, and colors from brand-name manufacturers. Why settle for bare floors when you want something more? Choose us for custom area rugs! It’s time to enhance the ambiance of your room? Let us help you accent your current décor. Much like a painting or new wall color brightens a living area, so our custom rugs offer the dramatic look you want. Whether you’re looking for a large or small rug, you can rely on our team to assist you in achieving the customized appearance you want. We Have a Rug for Any Room! Let us provide an area rug to suit your needs. Whether you have a long hallway, a wide room, or an oddly shaped layout, we’ll find a carpet that is right for you. There’s no need to locate several rugs to fit an odd space. Allow us to add warmth and continuity to your room with custom area rugs. Contact us for more information about our newest area rugs in stock. We proudly serve customers in and around Timonium, Towson, Carney, Cockeysville, and Butler, Maryland.